Two years? That seems like a very long time to allow for a single branch visit. How many of these visits happened because the service was not available through the account holder’s preferred channel? It is safe to bet the number is relatively high. Over half (66%) of consumers would open an account online or through mobile if it were easy (BAI). However, the majority of banks and credit unions have yet to make account applications fully automated through their website or mobile app. What about information, advice, and questions? One in three social media users turns to customer care on their preferred social media platform before telephone or email. It is possible the availability of fast and personal response is the primary limiter in taking these tasks online as well. Despite an apparent desire for the occasional branch visit, the number of account holders who prefer a physical location is dwindling (BAI). Overall reliance on branches has recently dropped from 30% to 16%, according to a survey from Novantas Research. Over half of consumers (56%) now prefer mobile and online banking to traditional branch interactions. So who is saying they want to see branches? 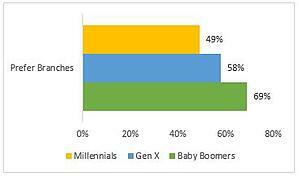 Mostly Baby Boomers, according to information published by the Federal Reserve. Those born between 1937 and 1951 were much more likely to list “location of offices” as an essential item when selecting their primary financial institution. Those individuals who were self-employed, wealthier, or older (age 45+) were more likely to use their financial institution’s branch locations. Younger generations sited typically noted fees and digital banking tools (Forbes). Financial institutions are still working to implement the groundwork for easy online implementation of their business. The products and services offered by banks and credit unions are often rife with complexities which require a more hands-on approach. While the proliferation of video conferencing, online chat, and appointment scheduling could provide solutions shortly, the branch is a steady and reliable fallback. Despite all of these factors, it is unlikely there will be a resurgence in branch visits. As the world turns more digital and self-service, it may be high time financial institutions make the extra effort to create fully functioning digital branches. Or risk being left behind.